Sabinene, one kind of monoterpene, accumulated limitedly in natural organisms, is being explored as a potential component for the next generation of aircraft fuels. And demand for advanced fuels impels us to develop biosynthetic routes for the production of sabinene from renewable sugar. In this study, sabinene was significantly produced by assembling a biosynthetic pathway using the methylerythritol 4-phosphate (MEP) or heterologous mevalonate (MVA) pathway combining the GPP and sabinene synthase genes in an engineered Escherichia coli strain. Subsequently, the culture medium and process conditions were optimized to enhance sabinene production with a maximum titer of 82.18 mg/L. Finally, the fed-batch fermentation of sabinene was evaluated using the optimized culture medium and process conditions, which reached a maximum concentration of 2.65 g/L with an average productivity of 0.018 g h-1 g-1 dry cells, and the conversion efficiency of glycerol to sabinene (gram to gram) reached 3.49%. This is the first report of microbial synthesis of sabinene using an engineered E. coli strain with the renewable carbon source as feedstock. Therefore, a green and sustainable production strategy has been established for sabinene. Progresses in metabolic engineering and synthetic biology boost the engineering of microbes to produce advanced biofuels[1–3]. Among the bio-based fuels, terpenes, which are derived from the head-to-tail condensation of dimethylallyl pyrophosphate (DMAPP) and isopentenyl pyrophosphate (IPP), and traditionally used in flavorings, fragrances, medicines and fine chemicals[5, 6], have the potentials to serve as advanced biofuel precursors[7–9]. Terpenes are a large and diverse class of organic compounds, which are mainly produced by a variety of plants. They are generated from the common precursors, IPP and DMAPP, which can be produced from the methylerythritol 4-phosphate (MEP) pathway or the mevalonate (MVA) pathway (Figure 1). Although many microorganisms harbor the MEP pathway or MVA pathway to supply the intermediates DMAPP and IPP, they are unable to produce the monoterpenes for the lack of monoterpenes synthases. With the rising demand for advanced fuels, terpene-based advance fuels attract more attentions. Many researchers explored microbial methods of monoterpene productions by introducing heterologous monoterpene synthase, including 3-carene, limonene, pinene and bisabolene. Reiling et al. engineered E. coli strain with overexpression native 1-deoxy-D-xylulose-5-phosphate synthase (DXS), farnesyl diphosphate synthase (IspA), IPP isomerase (IPIHp) from Haematococcus pluvialis, and 3-carene cyclase from Picea abies, which can accumulate a 3-carene titer of about 3 μg/L/OD600 after 8 h production. Carter et al. constructed a monoterpene biosynthesis pathway in E. coli with a titer of about 5 mg/L limonene production using the native MEP pathway. Bisabolene, α-pinene et al. had been produced using MVA heterologous pathway in microorganisms[9, 13, 14]. Sabinene biosynthesis pathway. Gene symbols and the enzymes they encode (all genes marked with black arrows were from E. faecalis, all genes marked with white arrows were isolated from S. cerevisiae, the gene marked with gray arrows and black characters were derived from A. grandis or S. pomifera, and the gene marked with gray arrows and white characters were native genes in E. coli). Enzymes in MVA pathway: MvaE, acetyl-CoA acetyltransferase/HMG-CoA reductase; MvaS, HMG-CoA synthase; ERG12, mevalonate kinase; ERG8, phosphomevalonate kinase; ERG19, mevalonate pyrophosphate decarboxylase; IDI, IPP isomerase; A. grandis geranyl diphosphate synthase (GPPS2) and S. pomifera sabinene synthase (SabS1) were optimized to the preferred codon usage of E. coli. Enzymes in MEP pathway: DXS, DXP synthase; DXR, DXP reductoisomerase; MCT, CDP-ME synthase; CMK, CDP-ME kinase; MDS, ME-cPP synthase; HDS, HMBPP synthase: HDR, HMBPP reductase; IDI, IPP isomerase. Intermediates in MVA pathway: A-CoA, acetyl-CoA; AA-CoA, acetoacetyl-CoA; HMG-CoA, hydroxymethylglutaryl-CoA; Mev-P, mevalonate 5-phosphate; Mev-PP, mevalonate pyrophosphate. IPP, isopentenyl pyrophosphate; DMAPP, dimethylallyl pyrophosphate; GPP, geranyl diphosphate. Intermediates in MEP pathway: G3P, glyceraldehyde 3-phosphate; DXP, 1-deoxy-D-xylulose 5-phosphate; MEP, 2-C-methyl-D-erythritol 4-phosphate; CDP-ME, 4-(cytidine-5′-diphospho)-2-C-methyl-D-erythritol; CDP-MEP, 2-phospho-4-(cytidine-5′-di-phospho)-2-C-methyl-D-erythritol; ME-cPP, 2-C-methyl-D-erythritol 2,4-cyclodiphosphate; HMBPP, 4-hydroxy-3-methylbut-2-enyl diphosphate; IPP, isopentenyl diphosphate; DMAPP, dimethylallyl diphosphate. Sabinene (CAS: 3387-41-5), a perfume additive, is being explored as the components for the next generation aircraft fuel[7, 8]. Meanwhile, sabinene contributes to the spiciness of black pepper, is a principal component of carrot seed oil, and occurs at a low concentration in tea tree oil. Currently, sabinene is extracted from plants, which is inefficient and requires substantial expenditure of natural resources because of the low content of them. Though sabinene was found in the culture of an endophytic Phomopsis sp. as a component of its volatile organic compounds, further work need to be done for microbial production method because of the low tilter in the mixture. Consequently, green and sustainable microbial technologies, which could engineer microorganisms to convert renewable resources from biomass to biobased advanced biofuels, provided an alternative strategy[17–19]. In this paper, sabinene was significantly produced by assembling a biosynthetic pathway using the MEP or heterologous MVA pathway combining the GPP and sabinene synthase genes in an engineered E. coli strain. Subsequently, the culture medium and process conditions were optimized to enhance sabinene production. Finally, fed-batch fermentation of sabinene was evaluated using the optimized culture medium and process conditions. E. coli cannot produce sabinene because of the absence of sabinene synthase, though it possesses a native MEP pathway which can supply the intermediates DMAPP and IPP (Figure 1). Consequently, sabinene synthase (SabS1) derived from Salvia pomifera was introduced into the E. coli strain (HB1), to synthesize sabinene. However, after 36 h of incubation of the modified strain, only trace of the target product could be detected by GC-MS (data not shown), based on the relative retention time and total ion mass spectral comparison with the external standard. The main reason might lie in the insufficiency of GPP in the host, because the wild E. coli seldom produces terpene. Hence, the native gene IspA from E. coli W3100, which encodes farnesyl diphosphate synthase, was added to enhance the metabolic flux into GPP by catalyzing the conversion of DMAPP and IPP. The gene IspA combining with the sabinene synthase gene (SabS1) was ligated into pACYCDuet-1 to create the plasmid pHB3 (pACY-IspA-SabS1). The E. coli strain harboring pHB3 was inoculated in the initial fermentation medium and incubated at 37°C with shaking at 180 rpm in shake-flasks. IPTG was added to a final concentration of 0.5 mM when its OD600 reached 0.6-0.9, and culture was further maintained at 37°C for 24 h. The off-gas from the headspace of the sealed cultures was tested by GC-MS. The engineered E. coli BL21(DE3) strain harboring the native IspA gene and SabS1 from S. pomifera produced sabinene in detectable quantities (shown in Figure 2). Thus, using the MEP pathway and SabS1 from S. pomifera, the biosynthetic pathway for sabinene production was successfully constructed in E. coli BL21(DE3). The result also indicated that introduction of GPP synthase was beneficial to enhance the metabolic flux into GPP which would improve the sabinene products efficiently. GC-MS analysis of sabinene from the headspace of the sealed cultures of strain HB2. Cultures were induced at 37°C, OD600 = 0.6-0.9, and final concentration of 0.25 mM IPTG. By comparing with the authoritative sabinene (A, B), the capacities of sabinene biosynthesis were verified. A, C, total ion chromatogram (TIC); C, D, mass spectrum. Based on the relative retention time and total ion mass spectral comparison with an external standard, sabinene production was identified. GPP synthase, is one of the rate-limiting enzyme in the sabinene synthesis of E. coli BL21(DE3). An effective method to optimize pathway efficiency may be to use genes of rate-limiting enzymes from different organisms. In this study, GPPS enzymes from Abies grandis (GPPS2) and E. coli were evaluated to enhance the supply of GPP. The GPPS2 gene from A. grandis or IspA gene from E. coli was cloned into the plasmid pACYCDuet-1 along with the sabinene synthase gene (SabS1) to create the plasmid pHB3 or pHB5, respectively, which were subsequently harbored by E. coli BL21(DE3) to screen the GPP synthase, because of the difficulty in detecting and quantifying GPP. The strains HB2 (harboring pHB3) and HB3 (harboring pHB5) were cultured in 600-ml shake-flasks with 100 ml of fermentation medium. When each culture reached an OD600 of 0.6-0.9, expression of GPP synthase and sabinene synthase was induced by 0.25 mM IPTG, and the culture was further incubated at 37°C for 24 h. A noticeable difference in sabinene production was observed between the two strains. The strain HB3 produced 2.07 mg/L sabinene, while the strain HB2 produced 0.96 mg/L (Figure 3A). This result demonstrates that the exogenous expression of GPPS contributed to the sabinene production, and the enzyme activity of GPPS2 from A. grandis was higher than that of IspA from E. coli W3100. IspA could give substantial amounts of the larger prenyl diphosphates, FPP and GGPP, in addition to GPP, that was why GPPS2 from A. grandis was more efficient than IspA in the synthesis of GPP. Hence, the GPPS2 was selected to enhance GPP production in the following experiments. Effect of GPP synthase and metabolic pathway on sabinene production. A: Effect of GPP synthase. GPPS1, GPP synthase form A. grandis; IspA, GPP synthase from E. coli. B: Effect of metabolic pathway on sabinene production, the pathway details were described in section Figure 1. The strain harboring GPPS2 can produce 2.2-fold higher concentration of sabinene than IspA, while the strain harboring MVA pathway can produce 20-fold higher concentration of sabinene than MEP pathway. The hybrid exogenous MVA pathway is effective to synthesize DMAPP and IPP according to previous experimental data. The recombinant strain HB4 (E. coli harboring the MVA pathway, GPPS and sabinene synthase) and strain HB3 (E. coli harboring the native MEP pathway, GPPS synthase and sabinene synthase) were cultured to test the effect of the MVA pathway on the production of sabinene, in fermentation medium under shake-flask conditions. The sabinene titer of strain HB4 reached 44.74 mg/L after being induced by 0.25 mM IPTG for 24 h with glycerol as carbon source and beef powder as nitrogen source (Figure 3B). The titer was about 20-fold higher than that of the strain HB3 cultured at the same conditions. These results indicated that the hybrid MVA pathway caused a huge increase in sabinene production, which was accordant with the production of other terpenes using a hybrid exogenous MVA pathway in engineered E. coli strains. One reason for the inefficiency of MEP approach was the regulatory mechanisms present in the native host. This limitation was also confirmed by experiments on isoprene production using the MEP or MVA pathway[23, 25]. It is because the hybrid exogenous MVA pathway is effective to synthesize DMAPP and IPP, which are the precursors of GPP. Consequently, we hypothesized that the engineered strain with the hybrid exogenous MVA pathway could further enhance the production of sabinene. Therefore, the strain HB4 harboring the hybrid exogenous MVA pathway was chosen for further experiments. Fermentation medium and culture conditions play a vital role in the formation, concentration and yield of the end product, and they also provide data for fed-batch fermentation. Optimizing fermentation medium and culture conditions for strains can make the fed-batch fermentation easy to get higher quality and quantity products. In this study, the one-factor-at-a-time method, which is based on the classical method of changing one independent variable while fixing all others[27, 28], is applied to optimize medium components as well as process conditions. The four most important factors, carbon source, organic nitrogen source, induction temperature, and inducer concentration were optimized to improve sabinene production, using the strain HB4. The source of the nitrogen in the medium, especially the organic, which can also provide trace nutrition for micro-being, plays an important role in improving the biosynthesis of desired products. Four different organic nitrogen sources were assessed to investigate the effect of organic nitrogen source on sabinene production (Figure 4A). Beef powder permitted a little higher sabinene production than other organic nitrogen sources, among the organic nitrogen supplements tried. The highest concentration of sabinene was 23.20 mg/L, which was about 1.4 times as much as the lowest observed yeast extract. 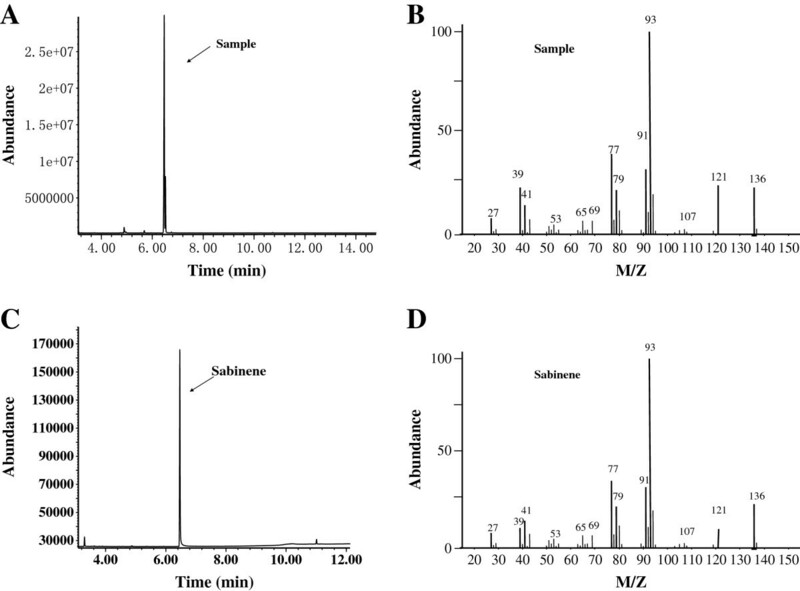 Effects of fermentation source and culture conditions on sabinene production by HB4. A: Effect of nitrogen sources on sabinene production; B: Effect of carbon sources on sabinene production; C: Effect of temperatures on sabinene production; D: Effect of the concentration of inducer on sabinene production. When OD600 reached 0.6-0.9, cultures were induced for 24 h using IPTG in shake-flasks. All the experiments were performed in triplicates. Optimized conditions: Nitrogen sources, beef power; Carbon source, glycerol; Temperature, 31°C; IPTC concentration, 0.1 mM. The source of carbon is the main feedstock in most fermentation media; therefore, finding efficient and cheap carbon source for sabinene production is important. In this study, mostly used carbon source glucose and glycerol were applied to investigate the effect of carbon source on sabinene production. As is shown in Figure 4B, the glycerol permitted a little higher sabinene production than glucose. The highest concentration of sabinene was 41.45 mg/L, which was about 2.03 times as much as that of glucose as carbon source. In this study, the induction temperatures of 25°C, 28°C, 31°C, 34°C and 37°C were tried to increase sabinene production. As is shown in Figure 4C, the maximum sabinene production was observed at 31°C, at 71.50 mg/L with beef power as nitrogen source and glycerol as carbon source. It was about 2 times greater than that observed at 25°C (36.12 mg/L), and 37°C (36.19 mg/L). The enzyme expression, cell growth and product formation should be balanced in a successful control of cultivation temperature. 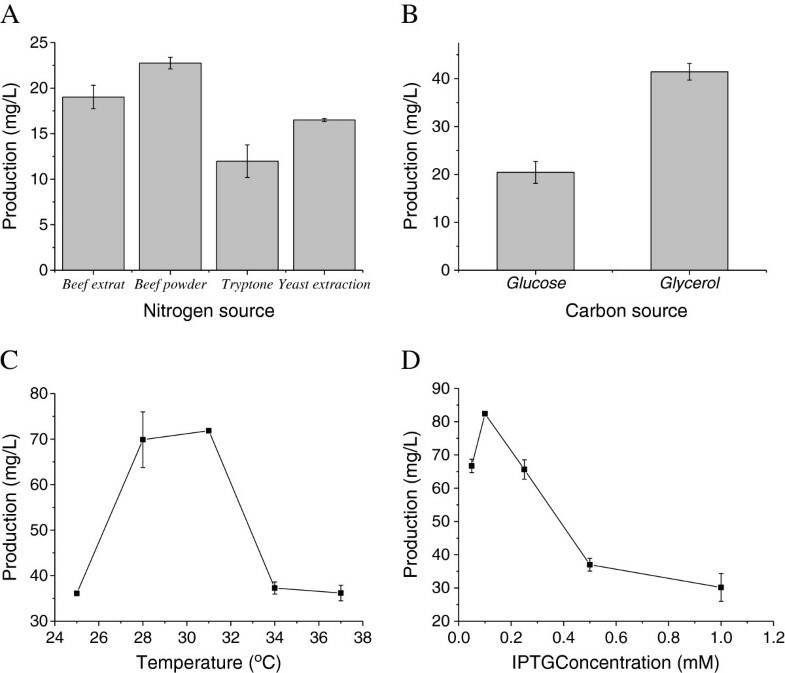 Because low temperatures decrease the inclusion bodies in genetically engineered E. coli, the activities of recombinant enzymes can be enhanced by low induction temperatures (25°C or 30°C)[30, 31]. Hence, the optimal induction temperature for sabinene production was around 31°C. To optimize the inducer concentration, various IPTG concentrations, ranging from 0.05 mM to 1 mM, were tested. The production of sabinene reached a maximum of 82.18 mg/L at the IPTG concentration of 0.1 mM, which was about 2.45 times greater than those observed at 1.0 mM (33.14 mg/L). The level of IPTG used can be varied to adjust the extent of the metabolic burden imposed on the cell, which can result in reduced growth rates, cell yields, protein expression, and plasmid stability[33, 34]. Therefore, the most suitable medium was using beef powder and glycerol as the nitrogen and carbon source, respectively, and optimal culture temperature for sabinene production was 31°C at the concentration of 0.1 mM IPTG using the engineered strain HB4. Toxicity of sabinene to the overproducing organism plays an important role in the biosynthetic process. The commercial sabinene imparts toxicity to E. coli when added exogenously to the medium (Figure 5). The E. coli cell growth was comparable at 0 g/L and up to 5 g/L of exogenously added sabinene. 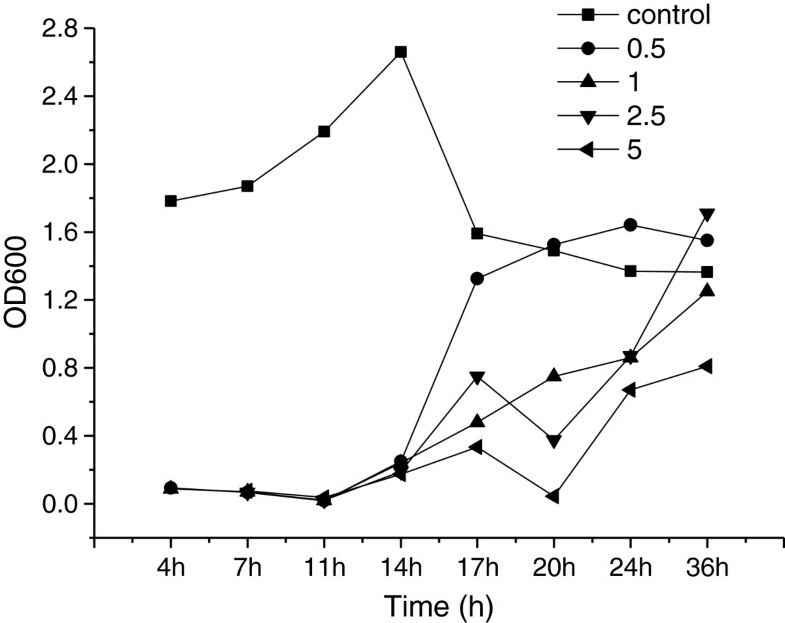 Though the log phase of E. coli was prolonged with about 12 h by even 0.5 g/L sabinene compared with the control, it can grow in 5 g/L sabinene with inhibiting rates of 70% after inoculation and cultured for 36 hours (Figure 5). The results indicated that sabinene can be produced with the engineered E. coli, but the production tolerance cannot be neglected to get high titers. The growth of E. coli in LB medium with different concentration of commercial sabinene. The growth of the bacterial culture was determined by measuring the OD600 (the optical density at 600 nm) with a spectrophotometer (Cary 50 UV-Vis, Varian) at 4 h, 7 h, 11 h, 14 h, 17 h, 20 h, 24 h and 36 h. The concentrations of sabinene were added to the LB medium as follows: 0 g/L (■), 0.5 g/L (●), 1 g/L (▲), 2.5 g/L (▼), 5 g/L (◄). The toxicity of products to the hosts is common in biosynthesis of biofuels and chemicals[3, 35]. Expression of efflux pumps, heat shock proteins, membrane modifying proteins, and activation of general stress response genes all can improve tolerance of the hosts[2, 3, 36]. Furthermore, in situ product removal and membrane technology both can be used in the production of sabinene to get high titers. Fed-batch fermentation was carried out using the engineered E. coli BL21(DE3) strain simultaneously harboring plasmids pHB7 and pTrcLower, in the optimized medium and culture conditions, to further determine the ability of the engineered strain to produce sabinene at high yield. Glycerol was added continuously when the initial carbon source was exhausted which was indicated by the sharp rise of DO. As is shown in Figure 6, sabinene production increased rapidly from 4 h to 20 h after induction. 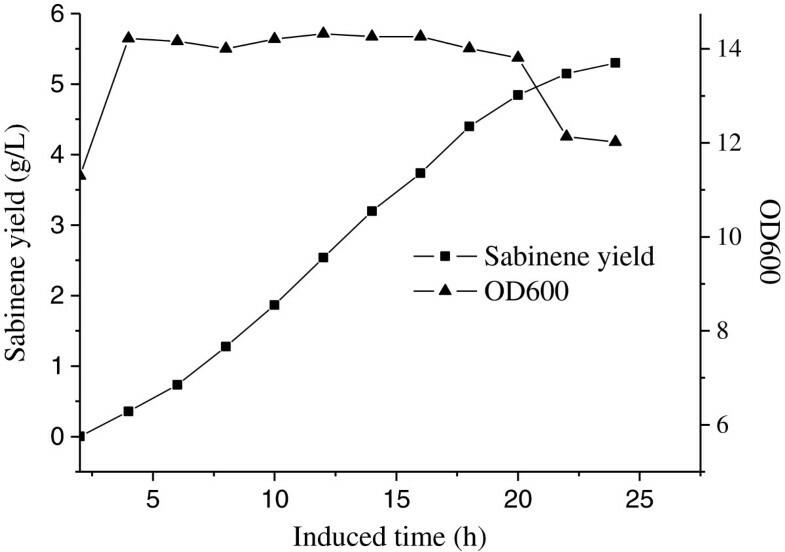 After the cultures were induced for 24 h, sabinene reached a maximum concentration of 2.65 g/L with an average productivity of 0.018 g /h/g dry cells, and the conversion efficiency of glycerol to sabinene (gram to gram) reached 3.49%. The time course of sabinene production by HB4 harboring pHB7 and pTrcLower in fed-batch fermentation. sabinene accumulation (■) and cell growth (▲). Induction was carried out at 12 h at the OD600 of 11. The maximum concentration of sabinene was 2.65 g/L with an average productivity of 0.018 g h-1 g-1 dry cells, and the conversion efficiency of glycerol to sabinene (gram to gram) was 3.49%. The maximum cell density of the engineered strain reached only about 14, four hours after being induced with IPTG, with a sabinene titer of no more than 0.5 g/L, which was rather low for the fed-batch fermentation of E. coli strains. The main reason for the low cell mass of E. coli strain may lie in the retardation of cell growth resulting from toxicity of the product, which was proved by the experiment of toxicity. Meanwhile, overexpression of many heterologous genes may be another reason. To resolve the above-mentioned problems, many possible improvements can be achieved to enhance sabinene production. One approach is to optimize the fermentation process by increasing cell density to elevate the yield of products[38, 39], using in situ product removal, membrane technology or dissociation of growth or cell mass formation from product formation to reduce the toxicity of sabinene. Another approach is engineering of the host including: employing a chromosome integration technique to decrease the cell growth burden on the host that results from overexpression of heterologous genes, expression of efflux pumps, heat shock proteins, membrane modifying proteins, and activation of general stress response genes to improve tolerance of the host to sabinene[2, 3, 36]. In this study, sabinene was significantly produced by assembling a biosynthetic pathway using the MEP or heterologous MVA pathway combining the GPP and sabinene synthase genes in an engineered E. coli strain. Subsequently, the culture medium and process conditions were optimized to enhance sabinene production. Finally, we also evaluated the fed-batch fermentation of sabinene using the optimized culture medium and process conditions, sabinene reached a maximum concentration of 2.65 g/L with an average productivity of 0.018 g/h/g dry cells, and the conversion efficiency of glycerol to sabinene (gram to gram) reached 3.49%. As far as we know, this is the first report of biosynthesis of sabinene using an engineered E. coli strain with the renewable carbon source as feedstock. Therefore, a green and sustainable production strategy has been provided for sabinene from renewable sources in E. coli. All plasmids and strains used in this study are listed in Table 1. E. coli BL21(DE3) (Invitrogen, Carlsbad, CA) was used as the host to overexpress proteins and produce sabinene. Cultures were grown aerobically at 37°C in Luria Broth (tryptone 10 g/L, NaCl 10 g/L, and yeast extract 5 g/L at pH 7.0-7.4). For initial production of sabinene experiments in shake-flasks, strains were grown in a medium (initial production medium) consisting of the following: 20 g/L glucose, 9.8 g/L K2HPO4, 5 g/L beef extract, 0.3 g/L ferric ammonium citrate, 2.1 g/L citric acid monohydrate, 0.06 g/L MgSO4 and 1 ml/L of trace element solution, which included (NH4)6Mo7O24·4H2O 0.37 g/L, ZnSO4·7H2O 0.29 g/L, H3BO4 2.47 g/L, CuSO4·5H2O 0.25 g/L, and MnCl2·4H2O 1.58 g/L. Ampicillin (Amp, 100 μg/mL) and chloramphenicol (Cm, 34 μg/mL) was added if necessary. Biosensor equipped with glucose oxidase membrane electrodes (Shandong Academy of Sciences, Jinan, China) was applied to determine the concentration of glucose. The experiments were carried out according to standard protocols. Polymerase chain reaction (PCR) was performed using Pfu DNA polymerase (TaKaRa, Dalian, China) according to the manufacturer’s instructions. E. coli BL21(DE3) genomic DNA was amplified as a template to obtain the IspA gene by PCR using the primers IspA-F and IspA-R (Table 2). The IspA gene fragment was digested using Bgl II and Nde I, and subsequently cloned into the corresponding sites of the vector pACYCDuet-1 to create pHB2 (Table 1). The SabS1 gene fragment (mentioned blow) was obtained by digestion of pGH/Pt30 with Bgl II and Xho I and was introduced into the corresponding sites of pHB2 to create pHB3. The geranyl diphosphate synthase gene (GPPS2, GenBank No. AF513112) from Abies grandis and sabinene synthase gene (SabS1, GenBank No. ABH07678.1) from Salvia pomifera were analyzed by online software (http://www.genscript.com/cgi-bin/tools/rare_codon_analysis) and optimized to the preferred codon usage of E. coli (http://www.jcat.de/). The codon-optimized GPPS2 gene and SabS1 gene were synthesized by Generay Company with plasmid pGH as the vector (pGH-GPPS2 and pGH-SabS1). The SabS1 gene fragment was obtained by digestion of pGH-SabS1 with Bgl II and Xho I and then cloned into the corresponding sites of pACYCDuet-1 to create pHB1.The GPPS2 gene fragment was obtained by digestion of pGH-GPPS2 with Nde I and Bgl II and then cloned into the corresponding sites of pACYCDuet-1 to create pHB4. The SabS1 gene fragment was obtained by digesting pGH-SabS1 with Bgl II and Xho I and was ligated into the corresponding sites of pHB4 to construct pHB5. As mentioned above, E. coli BL21(DE3) has its native MEP pathway to form IPP and DMAPP. Therefore, the MEP pathway for sabinene synthesis was constructed by harboring the plasmid pHB1 to introduce the exogenous sabinene synthase. Furthermore, to enhance the metabolic flux into GPP by catalyzing the conversion of DMAPP and IPP, the GPP synthase (IspA or GPPS2) was overexpressed or introduced. E. coli BL21(DE3) harboring pHB7 and pTrcLower was constructed to form the MVA pathway for sabinene synthesis. The mvaE (Genbank: AF290092) was amplified with the primer mvaE-F and mvaE-R from genomic DNA of Enterococcus faecalis (ATCC 700802D-5) and then cloned into pHB5 and with restriction enzymes Nco I and Bam HI, creating pHB6. The mvaS (Genbank: AF290092) was amplified from genomic DNA of E. faecalis (ATCC 700802D-5) with the primer mvaS-F and mvaS-R and cloned into pHB6 and with restriction enzymes Sac I and Pst I, creating pHB7. The ERG12, ERG8, ERG19 and IDI1 genes from S. cerevisiae (ATCC 204508) were cloned into pTrcHis2B (Invitrogen, Carlsbad, CA) using a method of successive hybridization to yield pTrcLower. The E. coli strain was inoculated in 50 ml of fermentation medium containing 34 μg/mL Cm and then cultured at 37°C with shaking at 180 rpm. When the OD600 of the bacterial culture reached 0.6-0.9, the cells were induced by IPTG at a final concentration of 0.25 mM for 24 h. Then, the off-gas samples were taken from the headspace of the sealed cultures and analyzed by GC-MS.
Products characterization was carried out by capillary GC-MS using an Agilent 5975C system chromatograph. A HP-INNOWAX capillary column (30 m × 0.25 mm × 0.25 μm, Agilent, Palo Alto, CA, USA) was used, with helium as the carrier gas at a flow rate of 1 ml min-1. The following oven temperature program was carried out: 40°C for 1 min, increase of 4°C/min to 70°C, then programmed from 70°C to 250°C at 25°C/min, where it was held for 5 min. The injector temperature was maintained at 250°C; ion source temperature 230°C; EI 70 eV; mass range 35-300 m/z. suitable amount of samples were injected in split injection mode with a 20:1 split ratio. Peak identification was based on the relative retention time and total ion mass spectral comparison with the external standard. The different strains were inoculated in 50 ml of fermentation medium containing 34 μg/mL Cm and/or 100 μg/mL Amp and then cultured under the conditions mentioned above. Finally, the off-gas samples were taken from the headspace of the sealed cultures and analyzed by GC. The GC analysis was performed on an Agilent 7890A equipped with a flame ionization detector (FID). The separation of sabinene was performed using an HP-INNOWAX column (25 m × 250 μm × 0.2 μm). The linear velocity was 1 ml/min with N2 as carrier gas. The oven temperature was initially held at 50°C for 1 min, increased at 5°C/min to 100°C to 250°C, and finally held at 250°C for 5 min. The temperatures of injector and detector were held at 250°C and 260°C, respectively. The peak area was converted into sabinene concentration in comparison with a standard curve plotted with a set of known concentrations of sabinene which was bought from Sigma-Aldrich. 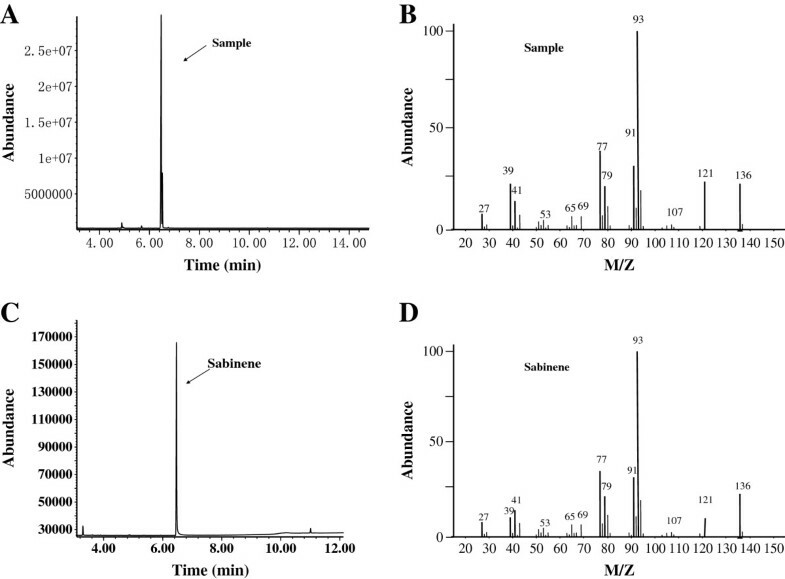 Optimization of fermentation medium was performed in shake-flask experiments in triplicate series of 600 ml sealed shake flasks containing 50 ml of fermentation medium incubated with the strain HB4. Amp (100 μg/mL) and Cm (34 μg/mL) were added when it was necessary. E. coli strains were cultured in the broth for initial production of sabinene and incubated in a gyratory shaker incubator at 37°C and 180 rpm. When the OD600 reached 0.6-0.9, IPTG was added to a final concentration of 0.25 mM, and the culture was further incubated at 30°C for 24 h. Then, 1 ml of gas sample from the headspace of the sealed cultures was quantified as described previously. Concentrations of synthesized sabinene were calculated by converting the GC peak area into milligrams of sabinene via a calibration curve. The shake-flask cultures were incubated in initial medium with different organic nitrogen sources (5 g/L): beef extract (solarbio), beef powder (MDBio, Inc), tryptone (Beijing AoBoXing Bio-Tech Co., Ltd) or yeast extract powder (Beijing AoBoXing Bio-Tech Co., Ltd)) at the above-mentioned culture conditions, and the sabinene products were detected. Carbon source is the main feedstock in fermentation. Therefore, the commonly used carbon sources (glucose and glycerol, 20 g/L) were screened in shake-flask with the nitrogen-optimized initial medium, at the above-mentioned culture conditions. The E. coli strain was inoculated in 50 ml of optimized fermentation medium and cultured with shaking at 180 rpm. The shake-flask cultures were incubated at different induction temperatures (25°C, 28°C, 31°C, 34°C or 37°C), when the OD600 of the bacterial culture reached 0.6-0.9, for 24 h in a final concentration of 0.5 mM, and the sabinene products were quantified. The shake-flask culture was incubated in different inducer (IPTG) concentrations (0.05 mM, 0.1 mM, 0.25 mM, 0.5 mM or 1 mM) at the optimized temperature for 24 h, and the sabinene products were measured. Where IR = Inhibition rate (100%); OD 600s = OD600 of sample; OD 600C = OD600 of control at the same time as the sample. The strain HB4 harboring pHB7 and pTrcLower was inoculated to 5 ml of LB medium (Amp 100 μg/mL, Cm 34 μg/mL, 37°C, 180 rpm), and then 100 ml fresh LB medium with corresponding antibiotics was inoculated with the 5 ml overnight cultures, which were used to inoculate a 5-L fermentor (BIOSTAT Bplus MO5L, Sartorius, Germany) containing 2 L of optimized fermentation medium (Amp 100 μg/mL, Cm 34 μg/mL). The temperature was maintained at 37°C firstly, and then 30°C after induced. The pH was maintained at 7.0 via automated addition of ammonia, and foam development was prohibited with 1% Antifoam 204. The stirring speed was first set at 400 rpm and then linked to the dissolved oxygen (DO) concentration to maintain a 20% saturation of DO, the flow velocity of air was 1.5 L/min. The expression of heterogenous genes for sabinene production was initiated at an OD600 of 11 by adding IPTG at a final concentration of 0.15 mM, and IPTG was supplemented every 8 h. During the course of fermentation, the 40% glycerol was fed at a rate 4 g/L/h. Then, sabinene accumulation was measured every 60 min by GC as described above. Meanwhile, the growth of the bacterial culture was determined by measuring the OD600 with the spectrophotometer, and the dry cell weight was calculated according to the coefficient (one OD600 unit corresponded to 0.43 g/L of dry cell weight). The specific productivity was calculated by the following equation. Where Qs = specific production rate (g/h/g dry cells); s = sabinene concentration (g/L); t = cultivation time (h), and x = biomass (g/L). Where Y = conversion efficiency (gram to gram, 100%); G s = weight of sabinene (g); G g = weight of glycerol (g). We greatly appreciate the financially support from the Qingdao Applied Basic Research Program (No. 12-1-4-9-(3)-jch), National Key Technology R&D Program (No. 2012BAD32B06), National High Technology Research and Development Program of China (863 Program, No. SS2013AA050703-2), National Natural Science Foundation of China (No. 21202179, 21376255), Knowledge Innovation Program of the Chinese Academy of Sciences (Y112131105). MX and JY developed the idea for the study, and helped to revise the manuscript. HZ designed the research, did the literature review and prepared the manuscript. HZ, QL, and JY did experiments, plasmid construction, strain cultivation, Fed-Batch fermentation and product detection. All authors read and approved the final manuscript.